Let’s pick up right where we left off in the first Guitar Noise tutorial on Travis Picking. I’m trusting that you have the basics down, particularly the “contrary motion” pattern. In this lesson, we’ll add what’s known as a “pinch” to that pattern, focusing on C and Am chords and we’ll also use the introduction of a fairly well-known song (Dust in the Wind by Kansas) as a cool way to practice what we’ve learned. You’ll also notice that I’m still counting out the example (and I’m encouraging you to do so as well), because knowing where the beat is supposed to fall is going to be very important in a minute! Okay, take a few moments and get that into your head. Because now it’s time to get it out of your head! Seriously, one of the things I mentioned last time out was that finger picking is actually not all that hard to get into. Once your fingers have a pattern, it usually takes a small amount of time and practice for them to get so into it that you pick up speed quite easily. This ease with which one takes to finger style is both a blessing and a bane. It’s good, obviously because we can, again with a bit of time and practice, get to the point where we can play a whole song, chord changes and all, just by using a single pattern, as we did in the first Travis tutorial with Dylan’s Blowin’ in the Wind. But it’s also bad because we get so set in a pattern that we can automatically default to it without thinking. And if we want to switch to a different pattern, or even simply to learn a new picking pattern, we often have to start from scratch. Again, you’ll hear me counting in the MP3 here. The reason is that we’ve got absolutely nothing going on in the second half of the first beat because we’ve shifted the first use of the fingers to the initial beat, when we pluck or “pinch” the strings with both thumb (picking the A string) and middle finger (playing the B string). If you’ve practiced using your thumb to keep a steady beat, counting the “one, two, three, four” of any given measure, this shouldn’t be all that big of a step for you. But before we move on, take some time and get this new pattern into your fingers. This “pinch” pattern is used in countless songs. I often refer to it, jokingly of course, as “generic folk pattern #2.” It’s amazing how easy it is to fall into once you’ve got it down. And it’s also very important because the pinch allows you to add a melody line to your playing. Elizabeth Cotton’s classic song, Freight Train, pretty much uses this pattern throughout, and which notes you fret and subsequently pinch) on the high strings sing out the song’s melody. Perhaps we’ll make a lesson of that at some point. But for right now, we want to concentrate on getting the pattern down to the point where we can play it and have a conversation while playing. Once we’re there, then we’ll start to do a bit of very simple ornamentation, which will lead us to the introduction of Dust in the Wind. A brief side trip, though – I made this past point in Guitar Noise Podcast #7 (which should have gone up online by now! Check it out at the Guitar Noise Blog and it bears repeating. 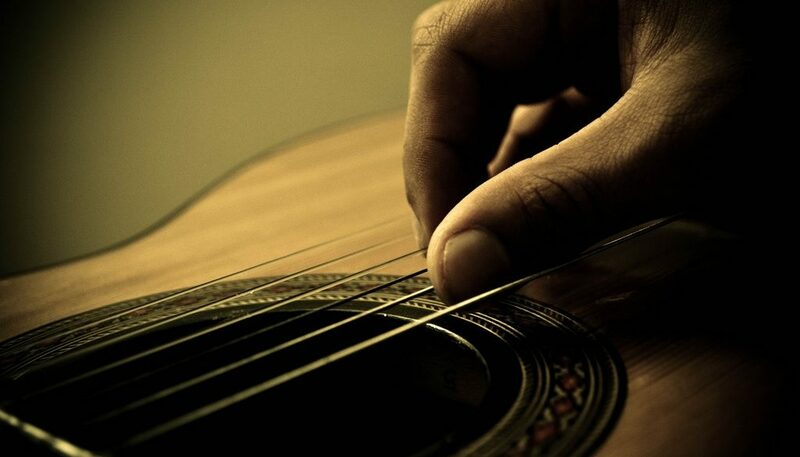 If you can get yourself to the point where you can play a pattern – strumming or fingerstyle or a combination of both – and hold a conversation, then you are more than ninety percent of the way there. Just as you saw with Blowin’ in the Wind, making chord changes while playing a fingerstyle song is a lot easier when you’re comfortable with the pattern (or patterns) you’re playing. It may take a little effort to coordinate both hands, but nowhere near as much effort if you decided to not learn the pattern first. Don’t let all the sixteenth notes get to you! All we’re doing is taking the pattern that you’ve already got in your fingers and using your thumb to measure out eighth notes instead of quarter notes. That’s all. So now your thumb is playing “one and two and three and four and…” instead of just “one, two, three, four.” Don’t be fooled into thinking it’s more than that. Now, that sound familiar, doesn’t it? The sticky point here for many is going to be the start of the third line. Switching between the Asus2 at the end of the second line and the Cadd9 that starts the third will take a bit of practice (preferably at a relatively slow tempo!) until you get to the point where you don’t worry about it. But hang in there! If you’ve followed any of the song lessons at Guitar Noise, you’ll know that this “pinch” method occurs quite frequently. You’ll find simpler variations on it in Bookends and Blackbird as well as more complicated uses in Julia, just to name a few. For now, though, get yourself together with this introduction and you’ll be more than halfway home when our complete lesson on Dust in the Wind gets online later this summer.